To some the answer is obvious, to others the thought may not have occurred. Each season our green spaces are faced with threats from many different directions. Fungus & insects are probably the most prominent. In order for plants to grow and pass nutrients, they all need one specific thing to achieve this. Nutrients are in the soil and proper nutrients are there if your are fertilizing your plants. To pickup the nutrients, plants need to have a healthy root system. In terms of your lawn, when we mow taller, we can achieve deeper root systems. When the roots are deep and healthy they can access nutrients they may have not previously had access to. WATER! Yes water is vital! If our plants don’t receive minimum amounts of water, they will go dormant and possibly die if the heat, mowing practices, playful activities, insects, fungus and other stresses are present. Proper hydration for humans is essential as it is for all living plants. THE SECRET: Many folks think that watering their lawn is expensive and too time consuming. We all have enough bills nowadays.. Why would we want to increase the water bill? Especially if you have invested in a nice looking landscape??? Well, if you think about it for just a moment you might realize if you don’t properly take care of your greenscape you may lose some or all of it. Many of us use the “liquid/granular plant foods” at the “big box” and hardware stores to maintain our ornamentals. We fertilize our lawns. But doing so is only half the battle. When our plantings are stressed from high heat and minimal rainfall, we should all be thinking about keeping them alive. How much would it cost you to repair a large section of your lawn if you lost it to drought or perhaps fungus or an insect attack? When your lawn is weak and without moisture, to keep nutrients flowing properly it WILL be susceptible to attack from these predators. Nutrient flow is solely dependent upon water. That is the carrier in which nutrients move around the plant. GOOD NEWS: It’s easy to water your lawn and you don’t have to do it every day or every other day to help your lawn recover from stress. Once or twice per week is all that is really necessary. Think of it this way. If you have a root system that taps into the soil 3″, you will need to water enough so that the moisture will reach down to the bottom of the roots if not a bit beyond. When you water your lawn deeply and thoroughly, the moisture will stay deeper in the soil, you’ll have less of a chance for evaporation and your grass plants will access that and bring it back up to the shoots of the plant to strengthen, pass nutrients and make photosynthesis. Of course, it will give you back the color you have been looking for. The most important thing to understand is that you DON’T want to water your lawn every day. DON’T DO IT! You are just promoting fungus! When you do water, you need to ensure that you are watering deeply. I would rather someone water their lawn for 80 minutes in each spot once per week than 10-15 minutes every day. Once or twice per week! Each spot.. 1″ – 1 1/4″ per week.. That’s it. Just take a plastic cup mark 1″ on it and water the lawn until there is 1″ of water in it. Or even a 1/2″. Make sure you time it. Once you do this you will know how long it takes (based off your sprinkler system and water pressure) to water your lawn. Water a half inch on Monday and the other half on Wednesday.. Or better yet. While it’s dry and hot and your lawn is looking brown, give it 3/4″ every 2 days for a week. After it is re hydrated you can back it off to once or twice per week. Then just watch the results! 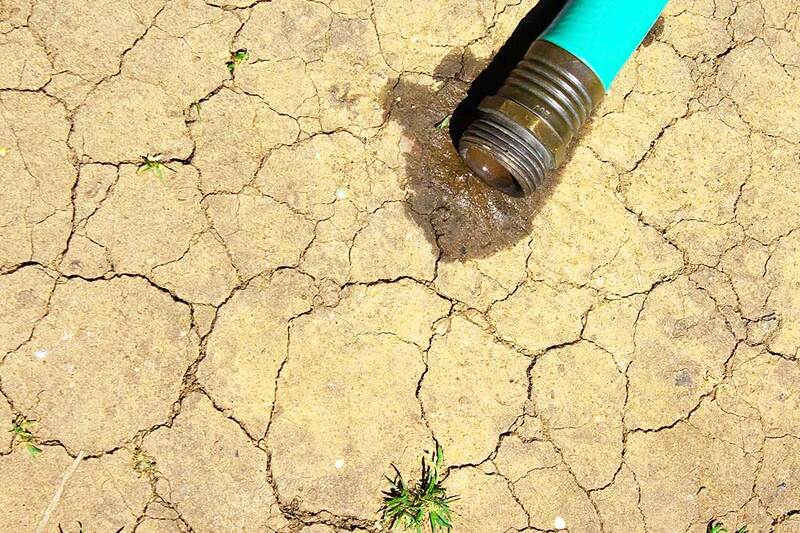 You may have to water longer if you have clay soil and the water doesn’t penetrate as easily as a sandy soil type. It will take a bit of time for your lawn to start turning green again. But as soon as the fall rains come back and the humidity goes away, you can stop watering your lawn. Yep. No real need to do it in the spring or the fall as Mother Nature usually does it for you. Each situation is different but in general, in our areas we usually receive on average enough moisture. The results usually show it too. Just ask yourself this question: How frequently “should” you mow your lawn in the spring and fall as opposed to the summer? If your turf areas are like most, your answer should be every 4 days in the spring and fall and maybe every week to week and a half in the summer. The important take away is when it’s hot and dry in the summer you should pay attention to your lawn. If it’s showing signs of stress and the weather forecast has no rain in it, you should yank out the hoses and give it a good drink! Don’t do it just once. Keep after it until we get some more rainfall in the forecast. If you want to keep your lawn green & healthy you should be vigilant in your watering when it’s necessary. Reviving a lawn that has begun to go dormant due to lack of moisture to only allow it to go dormant again robs the grass plants of energy making it even more susceptible to attack. If you can’t water…we understand! Just remember you may end up with areas that you may need to overseed in the fall. If you already have an irrigation system installed in your property, be sure that it is setup properly! Irrigation should not be working every morning. AAAAHHHH! You will be sure to have fungus if you keep that up. Especially during the high heat of summer! Minimize leaf wetness, maximize soil moisture by watering for a longer period but infrequently. We were informed by our lawn care specialist that it’s important not to water in the middle of the day or in the evening. Early mornings are best. Between 1 am – 8 am. REMEMBER: If your lawn is extremely dry right now and you have clay soils. It might take a longer watering to get the water to penetrate deep enough. Many lawns in Maine are comprised of clay soils.. It’s not porous. Also, good soil structure and a thick an healthy turf stand will retain moisture levels far better than cheap soil or clay base. Good organic matter based lawns will out perform dead soils day after day and year after year. This is another topic which will be discussed in another post. Great tips! Keeping a nice lawn, especially when there is a drought, can be tough!